In the human body, the femoral vein is a blood vessel that accompanies the femoral artery in the femoral sheath. It begins at the adductor hiatus (an opening in the adductor magnus muscle) and is a continuation of the popliteal vein. It ends at the inferior margin of the inguinal ligament, where it becomes the external iliac vein. The femoral vein bears valves which are mostly bicuspid and whose number is variable between individuals and often between left and right leg. The common femoral vein is the segment of the femoral vein between the branching point of the deep femoral vein and the inferior margin of the inguinal ligament. The subsartorial vein or superficial femoral vein are designations for the segment between the adductor hiatus and the branching point of the deep femoral vein, passing through the subsartorial canal. However, usage of the term superficial femoral vein is discouraged by many physicians because it leads to confusion among general medical practitioners. 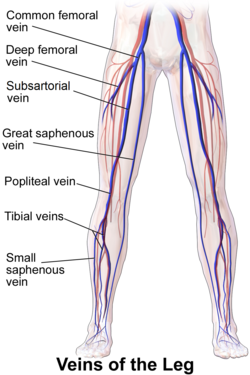 In particular, the femoral vein is clinically a deep vein, where deep vein thrombosis indicates anticoagulant or thrombolytic therapy, but the adjective "superficial" leads many physicians to falsely believe it is a superficial vein, which has resulted in patients with femoral thrombosis being denied proper treatment. Therefore, the term subsartorial vein has been suggested for the femoral vein distally to the branching point of the deep femoral vein. Great saphenous vein, into the common femoral vein. Deep vein of the thigh, whose entry marks the border between the subsartorial vein and common femoral vein. 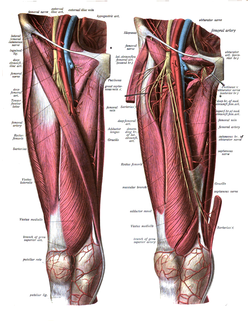 Popliteal vein, becoming the subsartorial or superficial femoral vein at the adductor hiatus. Occlusion of the femoral vein can be life-threatening due to its size. For example, deep vein thrombosis of the femoral vein can cause pulmonary embolism, with a higher risk when being more proximal to the subsartorial vein. The femoral vein is often used to place central venous lines. The practice of delivering recreational drugs intravenously using the femoral vein is relatively common amongst injecting drug users (IDUs). Doppler ultrasonography of deep vein thrombosis in the subsartorial vein. Drawing of the left femoral triangle - shows superior portion of the femoral vein. Femoral sheath laid open to show its three compartments. The spermatic cord in the inguinal canal. ^ Jonas Keiler; Marko Schulze; Host Claassen; Andreas Wree (2018). "Femoral vein diameter, valve and tributary topography in humans - a post mortem analysis". Clinical Anatomy. 31 (7): 1065–1076. doi:10.1002/ca.23224. PMID 30240062. ^ a b Page 590 in: Reva Arnez Curry, Betty Bates Tempkin (2014). Sonography - E-Book: Introduction to Normal Structure and Function. Elsevier Health Sciences. ISBN 9780323292177. ^ a b c Mikael Häggström (2019). "Subsartorial Vessels as Replacement Name for Superficial Femoral Vessels" (PDF). International Journal of Anatomy, Radiology and Surgery: AV01–AV02. ^ a b Bundens WP, Bergan JJ, Halasz NA, Murray J, Drehobl M. The superficial femoral vein. A potentially lethal misnomer. JAMA. 1995 Oct 25;274(16):1296-8. PMID 7563535. ^ Hammond I. The superficial femoral vein. Radiology. 2003 Nov;229(2):604; discussion 604-6. PMID 14595157. Full Text. ^ Kitchens CS (2011). "How I treat superficial venous thrombosis". Blood. 117 (1): 39–44. doi:10.1182/blood-2010-05-286690. PMID 20980677. ^ Maliphant J, Scott J. Use of the femoral vein ('groin injecting') by a sample of needle exchange clients in Bristol, UK. Harm Reduction Journal 2005, 2:6. Free Full Text. Gray's s157 - "The Arteries of the Lower Extremity"
Anatomy figure: 12:05-01 at Human Anatomy Online, SUNY Downstate Medical Center - "Veins of the lower extremity shown in association with major landmarks."